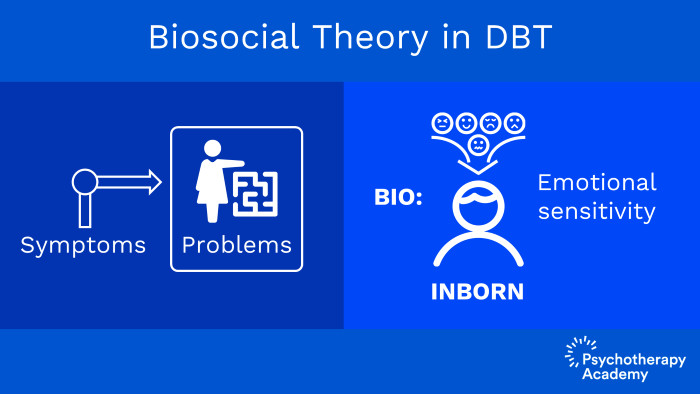 DBT’s biosocial model is the theory of how symptoms arise and are maintained. It is a no-blame model. 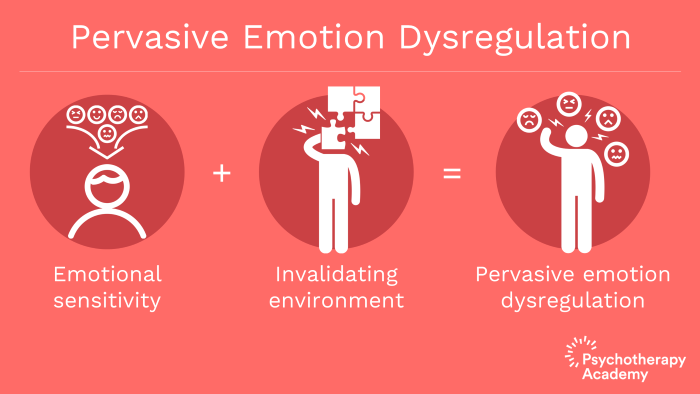 The equation for the biosocial model: emotional sensitivity plus an invalidating environment equals pervasive emotion dysregulation. An invalidating environment is one in which a person does not fit. It does not have to be an abusive one. The biosocial model is transactional in nature. Biosocial theory in DBT is the underlying theory which explains how symptoms arise and how problems continue not just with borderline personality disorder but in a variety of different psychopathologies within DBT. Biosocial model, the bio part of biosocial model involves the idea that emotional sensitivity is inborn. We all have different sensitivities in terms of our skin. We are more or less sensitive to the sun, more or less sensitive to detergents, perfumes, etc. We have biologically born sensitivities when it comes to our digestion, what we can eat and what causes us more difficulty. The same is thought to be true with our emotions. We are born more or less sensitive emotionally and that is not something that can be necessarily changed. That’s something that is part of your genetic makeup. That alone is not enough to cause difficulties. So in DBT, the idea is it’s the transactions over time with what is referred to as an invalidating environment that causes the trouble. An invalidating environment is one in which the individual doesn’t fit. An invalidating environment can be abusive, but doesn’t have to be abusive. When you have a person who is biologically born to be emotionally sensitive and you have them in an environment in which they don’t fit, the transactions that happen over time lead to emotion dysregulation due to the reinforcement patterns that occur. The core issue in DBT is pervasive emotion dysregulation. One of the ways that you can identify a patient that DBT is going to benefit is if their core characteristic is that they have emotion dysregulation. I think of emotion dysregulation as being a thermostat that wouldn’t hold steady, so particularly sensitive to distressing circumstances, seem to feel things more intensely than others. When a person is an invalidating environment, it’s almost like being born gluten intolerant and being born into a family of bakers. That would be a very difficult situation to be in. The person could not help that they were gluten intolerant or gluten sensitive. And the bakers, they’re not abusive or there’s no problem with being a family of bakers. But the problem comes in the combination of the two. When we have families or spouses who would ask, “Whose fault is it? Or why is it this way?” DBT considers it a no-blame model.It’s not the person who is coming in for treatment that’s to blame. It’s not the family that’s to blame. It is the transactions between the two that cause a problem.Invalidation in the environment maintains and may exacerbate the biological sensitivity of the individual. And patterns tend to arise between the two so that when they come in to treatment part of the treatment itself involves identifying and changing up these patterns that have led to the exacerbation of symptoms. The key points for this talk are that DBT’s biosocial model is the theory of how symptoms arise and are maintained. 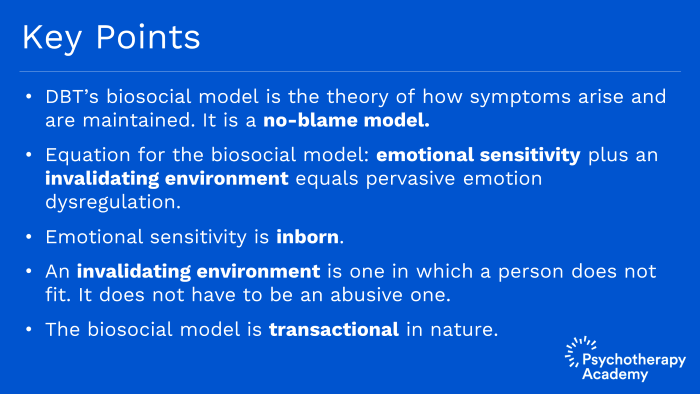 It is a no-blame model.The equation for the biosocial model is emotional sensitivity plus an invalidating environment equals pervasive emotion dysregulation. Emotional sensitivity is inborn. An invalidating environment is one in which a person does not fit. An invalidating environment does not have to be an abusive one.